Libby Fischer Hellmann has made a name for herself over the past decade as the author of “Compulsively Readable Thrillers.” With ten novels and nearly twenty short stories published, Hellmann is a diverse, talented author whose work spans the range of the crime fiction genre. Not only is Hellmann an accomplished writer, but she is leading the way in promotion innovations in what is a very crowded social marketing landscape. One new technology Hellmann has incorporated is a Glossi, a short, multi-media magazine designed to be viewed online. 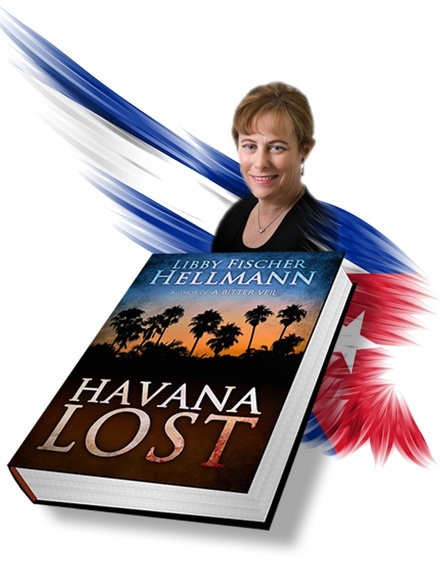 In Hellmann’s case, it showcases her newest thriller, HAVANA LOST, which is set largely in Cuba. It can be viewed at http://glossi.com/LibbyHellmann/31548-havana-lost. “I’m not afraid to try new things,” says Hellmann, “I seem to have a sense whether something works or doesn’t, and I highly recommend Glossi’s. I like them even more than a video trailer because readers can browse at their leisure.” Hellmann was introduced to Glossi by her nephew. Thus far, the tool has primarily been used by the fashion industry but Hellmann believes Glossi’s are an ideal vehicle for authors who want to build excitement for an upcoming novel. The timing was perfect, too, as HAVANA LOST will be out next month. In terms of results, the Glossi has proven to be the real deal for Ms. Hellmann. The HAVANA LOST Glossi was featured on the company’s website. A few days later Digital Book World, one of the leaders in e-book news, did a feature on it (http://www.digitalbookworld.com/2013/are-ebooks-going-glossi/) as well. HAVANA LOST is award-winning author Libby Fischer Hellmann’s tenth novel and third thriller that explores how strife and revolution affect the human spirit. HAVANA LOST is a testament to Hellmann’s gift for authentic historical detail as well as her talent for writing compulsively readable thriller. “Incorporating new technology is vital to any marketing campaign, especially in today’s volatile publishing climate,” says Hellmann. “And hey… sometimes it even works,” she laughs.